* Polymer Compound Resin (the 2-bottle kit such as Envirotex-lite. One bottle is your resin, the other is your catalyst). Pour very accurate amounts of both resin and hardner into a paper cup. 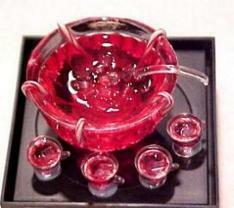 Add Red Transparent Dye, drop-by-drop until a good rich red color is obtained. STIR THOROUGHLY. Carefully pour the resin mixture into your punch bowl. Using a toothpick, fill cups. Add "ice cubes". Arrange candy canes around bowl by hooking them onto the outer rim. Insert ladle in bowl if desired. Allow to harden undisturbed for about 12 hours. NOTE: Just by changing the Transparent Dye used and perhaps different garnishes, you can create the Punch Bowl of your choice.....Champagne Punch, Strawberry Punch, Wassail Bowl, just to name a few. Enjoy! !